Do Not Wrap or Stake. Trunks of newly planted trees should not be wrapped. Yes, that includes red oaks. It’s a waste of money, looks unattractive, harbors insects, andleaves the bark weak when removed. Tree wrapping is similar to a bandage left on your finger too long. If you are worried about the unlikely possibility of sunburn, it’s muchbetter to paint the trunk with a diluted white latex paint. This is what the ISA (International Society of Arboriculture) has to say about wrapping. 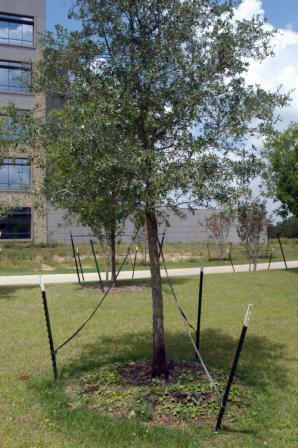 “Many early references recommend wrapping the trunks of newly planted trees to protect against temperature extremes, sunscald, boring insects and drying. More recent research indicates that temperature differentials at the bark are greater with tree wrap than without. Further, tree wrap tends to hold moisture on the bark and can lead to fungal problems. Also, insects tend to burrow between the bark and the wrap and can be worse with wrap than without it”. If nurseries would mark the north side of the trees as oriented in the nursery, the trees could be planted with exactly the same orientation and never experience any burn. Staking and guying is usually unnecessary if the tree has been planted properly with the proper earth ball size of at least 9” of ball for each 1” of trunk diameter. Staking is often a waste of money and always detrimental to the proper trunk development of the plant. Staked trees consistently produce less trunk taper, develop a smaller root system and are now subject to leaning when stakes are removed. In rare circumstances (sandy soil, tall evergreen trees, etc.) where the tree needs to be staked for a while, connect the guy wires as low on the trunk as possible and remove the stakes as soon as possible. Never leave staking on more than one growing season. Temporary staking should be done with strong wire and metal eyebolts screwed into the trunk. 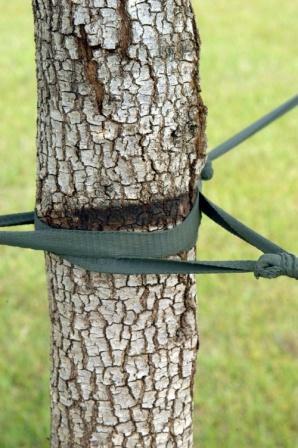 Staking should only be done as a last resort – it is unsightly, expensive, adds to mowing and trimming costs, and restricts the tree’s ability to develop tensile strength in the trunk. It can also cause damage to the cambium layer even when soft materials are used. Remove all identification tags at planting. Keep records on labels not connected to the tree. Do Not Overprune. Only those not up with current industry standards of proper horticulture recommend that limb pruning should be done to compensate for the loss of roots during transplanting or planting. Most trees fare much better if all the limbs and foliage are left intact. The more foliage, the more food can be produced to build the root system. The health of the root system is the key to the overall health of the tree. The only trees that seem to respond positively to thinning at the time of transplanting are field-collected live oak, yaupon holly, and other evergreens. Plants purchased in containers definitely need no pruning, and deciduous trees don’t need to be thinned. Pruning in general should be limited to dead, damaged or otherwise unsightly or rubbing limbs and branches.